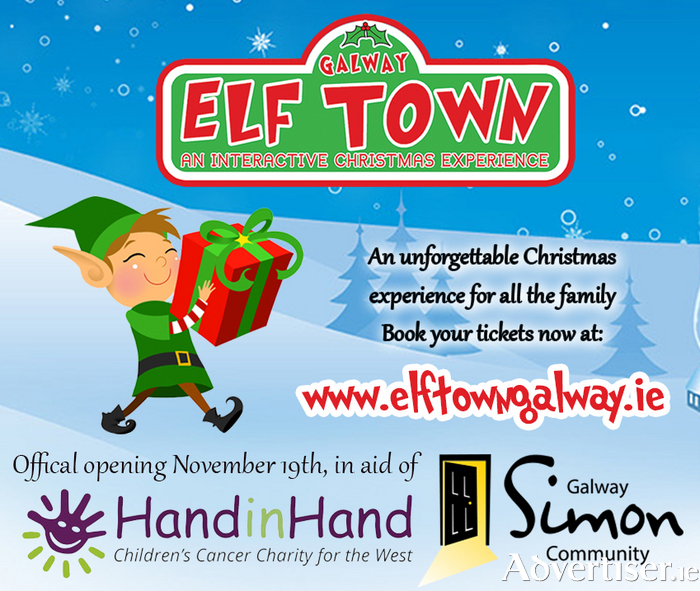 Elf Town Galway is a one-of-a-kind Santa experience that is launching on November 19th at 15 Market Street. In the true spirit of Christmas, the first 500 tickets will be donated to two local and worthy charities, Galway Simon Community and Hand in Hand. Tickets are selling fast for what is expected to be an unmissable, magical experience for all the family. Children will have the opportunity to meet the Snow Princess in the amazing Elf Grove and make their way down Elf Terrace where they can throw snowballs at the sleepy elves! They will venture past the Elves Workshop and the hectic Wrapping Station, straight into Mrs Claus’s kitchen where they can decorate their own cookie and write a letter to Santa. They will then enter the exciting Mission Control room - where the elves help Santa plan his annual Christmas outing. At the end of the journey they can relax in the Cuddly Corner, take photos in the sELFie station or simply have a mince pie – all whilst waiting for their personal trip to see Santa. Each child receives a gift from Santa, cookie with Mrs Claus, an Elf hat, passport and Elf badge. Complementary mulled wine or fruit punch will be available to adults accompanying their children on the adventure. Further details about the launch day will be announced soon, including the name of the special guest who will be cutting the ribbon. Representatives from both charities will be attending and aiming to raise awareness on the day. Hand in Hand is a non-profit organisation that provides practical home support services to families throughout the Republic of Ireland who have a child diagnosed with cancer, giving families more precious time to spend with their children. Galway Simon Community provide services to people who are homeless or at risk of homelessness, working with people in the areas of homelessness prevention, housing and health & well-being. Elf Town is open to the public from November 20th-December 24th. Tickets are on sale now at www.elftowngalway.ie. Pre-booking is strongly advised and guarantees your entry at a specific time. There will be limited availability per show; many time slots are fully booked and some days are close to capacity. Discounted rates for groups are available on certain dates. There will also be a special early opening for children with autism or sensory needs on December 16th-17th. For more information email [email protected].